The San Damiano Cross is very significant to Franciscans. It’s a symbol with a great deal of meaning that’s part of our identity. If you know someone with this cross in their home they’re very likely to be a Secular Franciscan! This Byzantine style cross takes its name from the small church at San Damiano where Francis heard the voice of Christ. Today the original cross can be found in the Basilica of Saint Clare (Basilica di Santa Chiara) in Assisi while at the church of San Damiano is a copy of this cross which speaks so much to Franciscans and the Franciscan family. 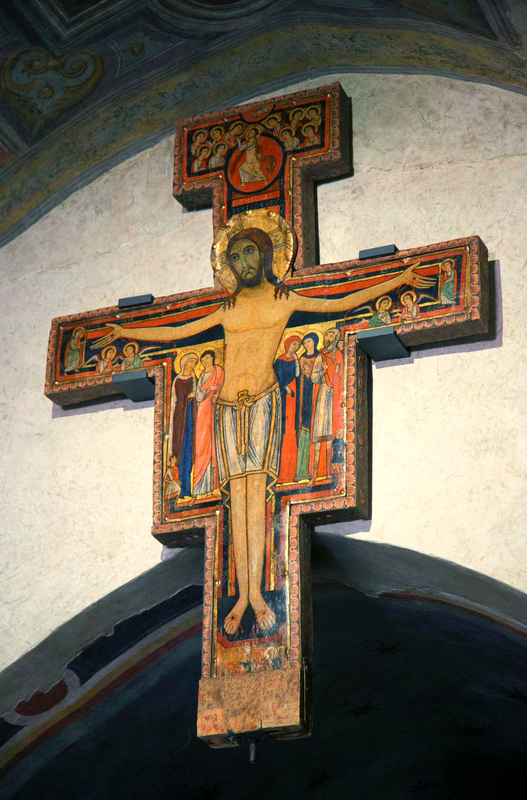 The San Damiano Cross : When Jesus spoke to Francis. The San Damiano Cross like many of Medieval Europe contains a lot of information. 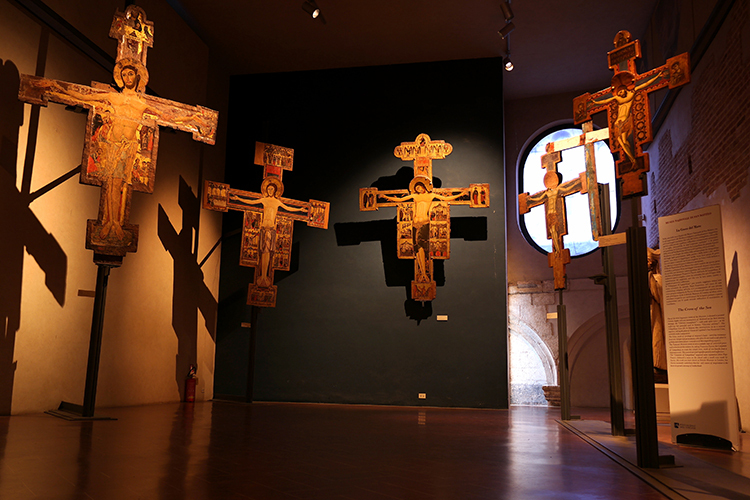 In the thirteenth Century these crosses, rich in imagery, helped to visually explain the Resurrection. Perhaps we could consider them as visual sermons with depth of colour and meaning waiting to be explored, read and understood. 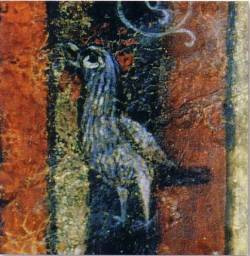 A significant thing to notice in crosses of Medieval Europe is the decorative imagery to either side, above and below Christ. Perhaps one of the most striking aspects of Byzantine Crosses is Christ himself. Jesus does not have the body of a man in agony. Instead he stands tall with arms of strength and eyes wide open radiating the hope of the Resurrection. He does not hang from the cross but seems to be strong enough to support it. His hands are no longer nailed or cramped, but are open, perhaps welcoming us or maybe they’re open serenely in supplication or acceptance. This cross shows no horror of death, instead we see Our Lord’s nobility, peace and gentleness of eternal everlasting life. We see his crown of thorns replaced by a halo of radiance as he stands in victory and glory. 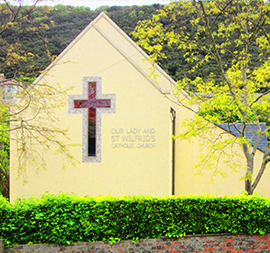 Above Christ’s head is the Latin inscription IHS NAZARE REX IVDEORV [Jesus of Nazareth King of the Jews – often abbreviated as INRI]. This is where the San Damiano Cross differs from most Byzantine crucifixes or crosses of Eastern Catholic Churches who use the inscription Jesus of Nazareth King of Glory [Царь славы]. Looking at the San Damiano Cross our eyes are draw again to how Christ is standing. He is standing tall on the short crossbar or shelf. There is no sign of brokenness. His feet stand upon the short crossbar or shelf. Unlike most of our Western Catholic Crosses Christ’s feet are not nailed together, they stand separately fully supporting him. This image shows us his relaxed attitude and that he suffered his passion by choice. Let’s now look at the top of the cross. Here Jesus is ascending into Heaven joining an angelic host. He is moving up towards God’s right hand, welcoming him in blessing. His cross of torture has become a golden Royal Sceptre of victory. He wears a priest’s red stole signifying his sovereignty, dominion and love. This is heavily symbolic of victory over suffering, false accusation and misunderstanding. It’s about the hope to come and love. Christ is being welcomed by His Father and is showing us The Way. At Christ’s hands most say are six angels discussing his crucifixion. But on the original cross whether to two figures standing are angles is not certain – perhaps the four obviously with wings, and seated, are angels, whilst the two men standing at Christ’s palms are two men St Peter and the unnamed disciple mentioned in John’s gospel who were witnesses of the empty tomb? However modern copies of this Franciscan icon do depict all six figures with wings. The important people beside Jesus on Byzantine style crosses are usually referred to as the Major Witnesses. The San Damiano Cross has five witnesses. On the left is the Blessed Virgin Mary and John the Beloved. On the right is Mary Magdalene, Mary Clopas [mother of James] and the Centurion of Caperaum. A little above the Centurion’s shoulder we can see the face of his small boy who was healed by Jesus [John 4 : 46-49]. 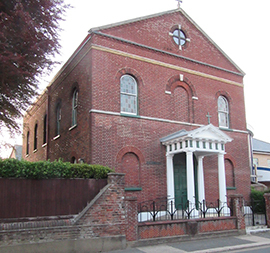 We then have two Minor Witnesses, these are the smaller figures to the left and right of the Major Witnesses. On the left is Longinus holding the spear that pierced Christ’s side, and on the right is Stephanos who offered Christ the sponge soaked with vinegar. Unfortunately not clearly obvious on the image above is a cockerel. It’s on the right [at the level of Christ’s left calf] reminding us that St Peter terrified for his own life denied knowing Jesus for three times before the bird crowed [Luke 22 : 54-62]. Perhaps this is telling us to remain ever vigilant of our own weaknesses? The colours of the San Damiano Cross have relevance to us today. It’s main three colours of black, red and gold can be considered as a sermon of conversion. Black represents sin and our need for penance and daily renewal. Red is an indication of sacrifice – our sacrifice of self, to be the lesser one and of kenosis and to know and feel that God’s Holy Spirit dwells within each of us. Red is also a colour of love, the love we have for Our Lord, the love we share with others and the love we need to have for ourselves. The San Damiano Cross is a sermon which without words says so much. In the spirit of Franciscan simplicity let your eyes gaze on our Lord and the Cross, allow your thoughts and desires to contemplate the wounds of Jesus which became the fount of love and life that saves. Consider your own wounds and threats that block your path and relationships with God, your Brothers and Sisters in life and others you meet. Say to yourself “Through His wounds, I was healed” [cf 1 Pet 2:24] as the blood flowing from Christ’s wounds cleanse and heal you. Feel the embrace as you become wrapped in the arms of the Crucified One, do you sense his love? And transform your entire being into the image of the Godhead Itself through contemplation. Almighty, eternal, just and merciful God, grant us, in our misery [the grace] to do for you alone what we know you want us to do, and always to desire what pleases you. Thus, inwardly cleansed, interiorly enlightened, and inflamed by the fire of the Holy Spirit, may we be able to follow in the footsteps of your beloved Son, our Lord Jesus Christ, And by your grace alone, may we make our way to You, Most High, who live and rule in perfect Trinity and in simple Unity, and are glorified God all-powerful forever and ever.